Can I be compensated for damage caused by a truck’s tire debris hitting my car? Augusta Georgia Personal Injury Lawyer Chris Hudson Brings It Have you been hurt in an accident and the insurance adjusters are trying to give you less money than you're entitled to? Call Chris Hudson. He will bring it! As you drive down a busy road or highway, you probably see all manner of debris. Garbage, road kill, and tree branches are scattered across the lanes, making driving to work more of an obstacle course than a leisurely commute. Most of these things in the road will not cause major damage to your car—maybe just a chip in your paint or on your windshield—but there is one thing that tends to strike fear into every driver. Truck tire treads are heavy, large, and capable of doing serious damage to your car. If you are ever hit by a tread at highway speeds, you could be seriously injured on top of the damage done to your vehicle. Can you hold the truck driver responsible for this tire tread hitting your car or causing a truck accident? Was it the driver’s fault, or simply bad luck? After all, you cannot control when you get flat tires—can you really expect more from truck drivers? By following these guidelines, tires—both in original condition and retreaded tires—can remain safe for both the truck driver and the other drivers on the road. If you’re pursuing a claim against a trucking company because your car was damaged (or you were injured!) by truck tire tread, one of the most difficult tasks is proving that the tire tread actually originated with the truck in question. All too often, the tread may seem to have come from one truck, only to later find out that the tread had been in the road for some time prior to the truck driving over it and throwing it into your windshield. If your car sustained serious damage from truck tire tread debris and you were injured as a result, you may be entitled to compensation from the truck driver or the trucking company for your damages. 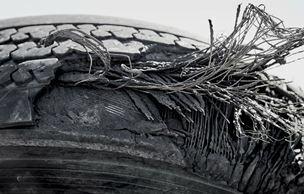 In order to secure your odds of compensation, you will need to prove that the tire tread debris came from a specific truck—and an experienced attorney can help. Contact us online or call us directly at 888.795.6261 to schedule your free consultation.